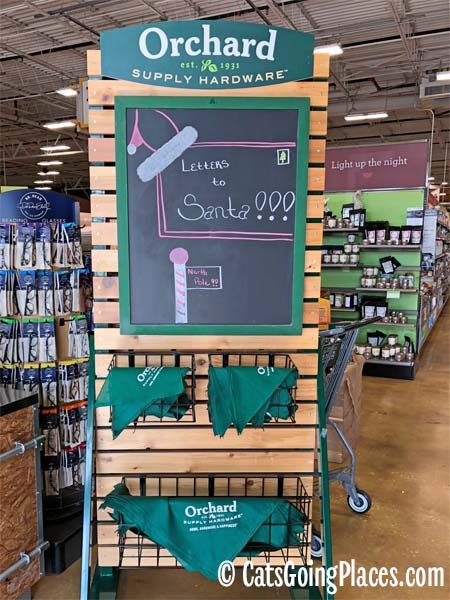 Leading up to the holidays, we had a chance to visit our local Orchard Supply Hardware store. They are, as the name implies, a hardware chain. 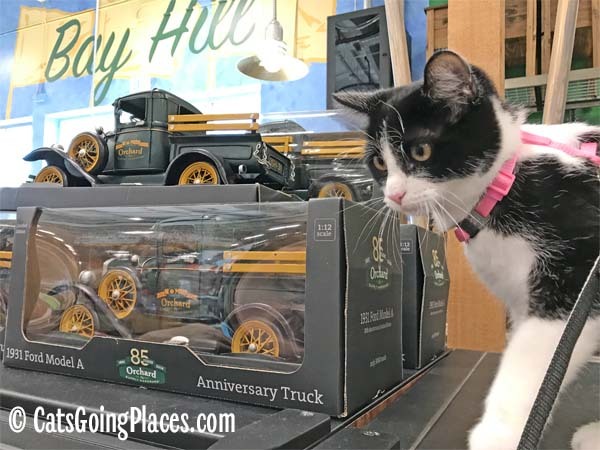 Smaller than a big box store, the people who work there all seem incredibly friendly and helpful, and they were excited to see Cupcake as a first-time visitor. 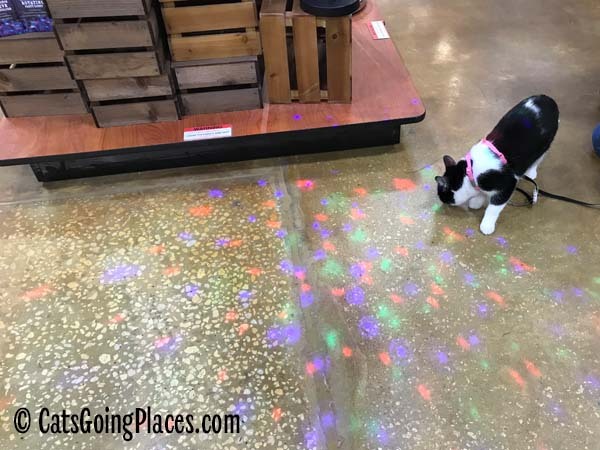 The Orchard Supply Hardware chain is known as a pet-friendly place to shop. They are so welcoming to four-legged visitors they even have a display just inside the door with free bandannas for your visiting pet. Since Cupcake had never worn a bandanna, I opted not to put one on her so I didn’t risk causing her additional stress. 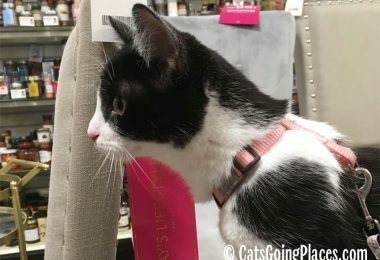 As soon as we got past the bandanna display, the employee from the paint counter was able to see us, and she was so excited to see Cupcake that she ran around the end of the counter to ask to pet Cupcake. This was a big win, since one of Cupcake’s least favorite things about hardware stores is the paint shaking machine and the unexpected noise of the mallet used to put the lid back on the paint can. As long as the paint lady was petting Cupcake, there weren’t going to be any alarming paint counter noises. When we visited, the seasonal section of the store was full of Christmas items, crowding the usual grills and patio furniture a bit. 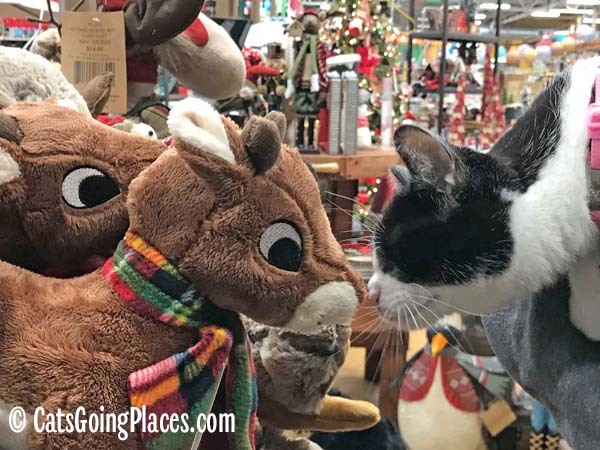 Cupcake immediately made a friend among the Christmas display. The rest of the store was full of the usual things you expect to find in a hardware store. There was an outdoor garden center as well as a section for indoor plants. 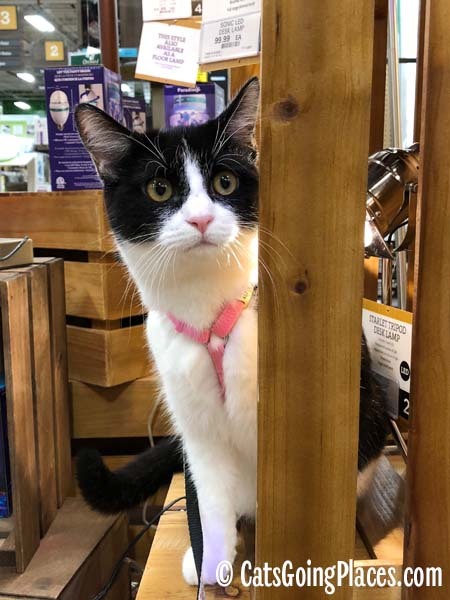 The outdoor garden center for our nearby store faces a busy road and is too loud for Cupcake, but the employee working in the garden center came inside to meet Cupcake and tell us all about her cat. She asked that when we returned for another visit, we be sure to ask for her to come inside so she didn’t miss us. 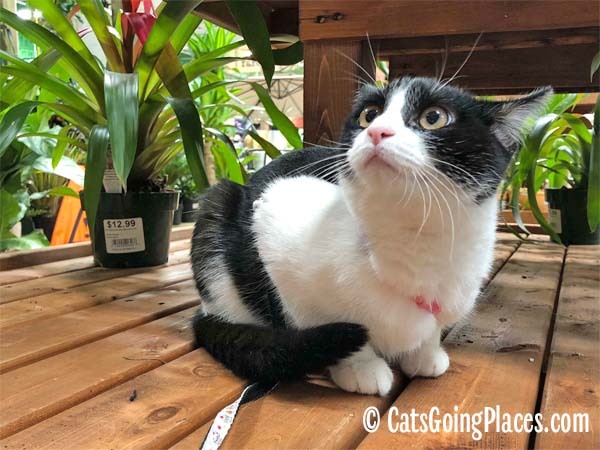 The section for indoor plants was like a little jungle, and Cupcake had to check it out. She approved of the shady spot she found to lurk where other customers didn’t notice there was a cat among them until they were nearly on top of us. That meant strangers ended up popping into view close by, something I discovered Cupcake wasn’t very keen on. Her disapproving expression in the photo below was for a stranger suddenly showing up in her field of vision. When we got to the lighting display, we found they were featuring a fancy light bulb that made colorful lights dance around on the floor. Cupcake wasn’t sure what to make of the moving lights, but she couldn’t smell them… or catch them. As long as she wasn’t being carried, Cupcake took some time to explore the whole lighting display. She followed them along the floor, but she never figured out where those moving lights came from. An employee who had not seen Cupcake in the front of the store stopped to find out why I was sitting on the floor in the aisle taking photos of the lighting display. 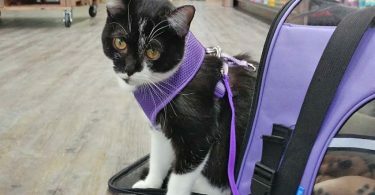 He didn’t see Cupcake at first, but once he did, he commented that usually the greeter at the front of the store tells everyone over the radio that a dog has arrived. This can cause all of the employees to hurry to the front of the store to pet the dog. We came in while the greeter was away, so we surprised him unannounced, but he was happy to make Cupcake’s acquaintance. 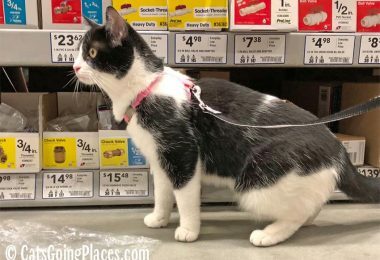 We had a great visit to Orchard Supply Hardware, and Cupcake will be back to visit her friends there again! 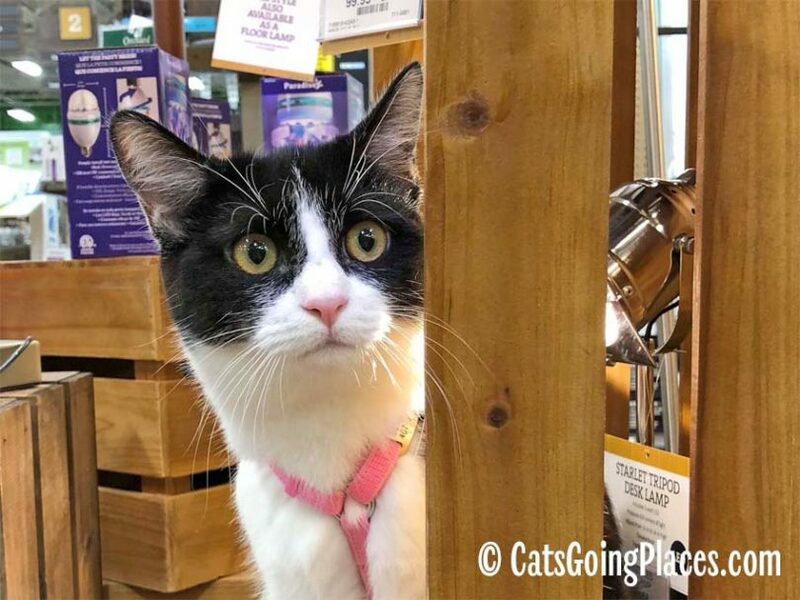 If there is a store in your area, it’s nearly a sure thing that they would be delighted to have your cat going places visit them, too. If you do, we would love to hear about your visit! Cupcake doesn’t seem to like the idea of an announcement, but as a former retail worker, I totally adore that idea. 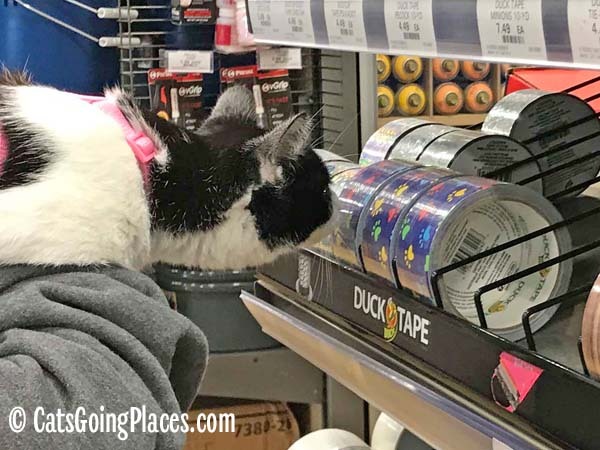 Many hardware stores are pet-friendly. Looks like Cupcake had a great experience. We live and travel full time on a sailboat. We meet lots of cats on board. 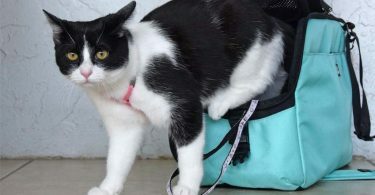 In fact, marinas are one of the places we regularly see cats on leash. So Cupcake has a tribe of cats on the go–they’re mostly on boats. Oh! I wonder if the Osh near us has bandanas… ’cause you know I will wear one! I’m putting that on my human’s to-do list now, since I haven’t been. They probably do! I have seen them sharing photos on their social media of dogs wearing them from lots of locations. The employees at your local store will be thrilled to meet you, Summer! What a brave little girl Cupcake is. 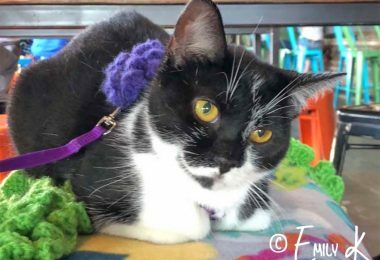 We are so glad to hear of the places that will accept kitties and doggies to their stores. This helps people to understand animals as feeling beings and not just farm animals. We all need to keep in mind that all animals have feelings and needs, the better off we will all be. Keep up the good work, Cupcake!